Not All Hail Causes Damage. Know the Difference! Hail storms are not that common in our area and when we do get a storm, the size of the hail ball is typically less than one-inch in diameter. 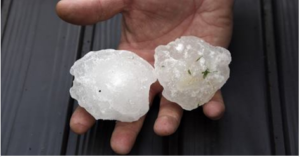 In contrast, the mid-west or other hail prone regions see golf ball sized hail regularly throughout the storm season (like in the picture below). Hail that large causes obvious damage. Neighborhoods look like war zones with large holes in siding and shutters, broken windows and smashed cars, and many downed branches scattered everywhere. Bowie and the surrounding area was recently hit with a hail storm and I can assure you, it isn’t a war zone. In fact, some homeowners probably didn’t even know there was a hail storm if they were not home or not watching through the windows as hail only comes down for a few minutes. But does that mean there is no damage to your home? Hail damage can be categorized into either functional or non-functional. Non-functional hail is where damage is simply cosmetic and does not decrease the shingle’s ability to shed water or long-term service life. 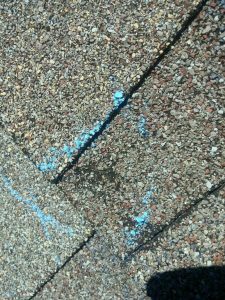 Functional hail on the other hand is more than just cosmetic and actually hurts the shingle’s ability to shed water properly or causes the shingle to deteriorate more quickly. Functional hail often causes leaks overtime and can become a costly nightmare. How Can You Spot the Difference? You will have to get on your roof and do a thorough inspection. You may be able to see hail hits on your soft metal from the ground which is in indicator hail hit your home, but you will not be able to tell if it is functional damage or not unless you get up close. Once you get on your roof, you want to look for marks like this one. They may be incredibly hard to spot, especially if you are not trained and unsure of what to look for. A mark like this can easily be mistaken for normal wear and tear when in reality, it is functional hail damage that could leave your home vulnerable. If you do find a mark like this, we recommend calling a professional who is Haag certified (like us). You never want to gamble with your home and we wouldn’t want to you to, which is why we offer an inspection at no charge. Contact us today to set one up!